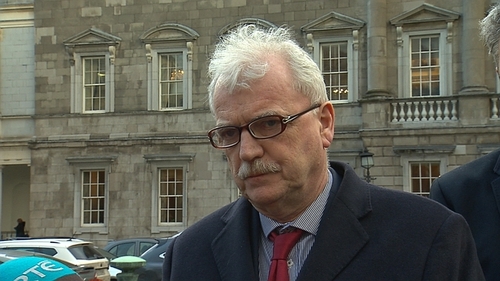 Minister of State for Disability Finian McGrath has said there is no evidence that repealing the Eighth Amendment would result in fewer children with disabilities being born in Ireland. Mr McGrath criticised those who had "negatively" raised the disability issue in the referendum campaign. He said that as a minister and as a parent of a daughter with an intellectual disability this was wrong. He said it was being implied by some that given a choice parents would have an abortion rather than a child with disabilities and this was not right. Minister McGrath also said the Eighth Amendment discriminates against women with disabilities. He said people with disabilities should always be free to make decisions about their personal and private life and all barriers to equality should be removed. The minister was speaking at a joint press conference organised by Inclusion Ireland and Together for Yes. "Women with disabilities often have more complex medical needs. Normal, good medical practice would be that a woman is cared for by her own medical team at home rather than having to travel," Together for Yes spokesperson Dr Mark Murphy said. The founder of Disabled People Together for Yes, Evie Nevin said: "It is hard enough for able bodied people to access abortion, never mind the added barriers of accessibility, mobility, finances and illness that goes with having a disability." Meanwhile a spokeswoman for the Save the 8th campaign has said she cannot guarantee that people under the age of 18 will not see their new online drive entitled '12 weeks'. The campaign shows social media users a video of a scan of an unborn baby at 12 weeks gestation, and ask them if the unborn child is deserving of constitutional rights. Speaking on RTÉ's Drivetime, Niamh Uí Bhriain said the target audience is people who are 18 and over, but added that "Facebook is probably less good at its advertising than it lets on." When asked if she feels the images might be traumatising for some, Ms Uí Bhriain said: "We can't have a discussion about abortion, or about this proposal in particular if we are going to ignore the humanity of the child; if you are going to ignore the person who is most affected by abortion. She added that she believes TV broadcasters should also broadcast the video.